The Central government has told the Supreme Court that Dassault Aviation, the Original Equipment Manufacturer (OEM) in the Rafale deal, is yet to submit a formal proposal providing the details of the Indian Offset Partner. Further, it has stated that it has no role in the selection of Reliance Defence as Offset Partner in the Rafale deal. Interestingly, this statement is made in a PIB release which has been annexed to the main document which sets out the details about the deal. The response by the Centre states that the process laid down in the Defence Procurement Procedure was completely followed for the procurement of 36 Rafale Aircraft. 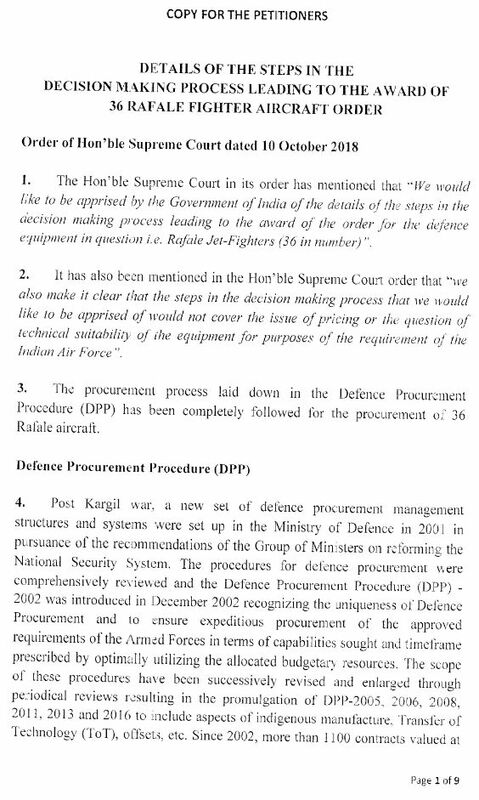 The Defence Procurement Procedure 2013 was followed in the procurement of the 36 Rafale Aircraft, the Centre has stated. The Indian Air Force had been making efforts to procure new aircraft to replace ageing planes and to have the capability to fight a two-front war. Pursuant to the same in principle approval to procure 126 aircraft was granted by the Defence Minister in 2001. However, the process for procuring the same remained inconclusive due to a variety of factors as set out in the government’s response. During this period, our adversaries inducted modern aircraft and upgraded their older versions. This made the situation extremely asymmetric and critical. Hence, there was an urgent need to arrest the decline in the number of fighter squadrons in the IAF and enhance their combat capabilities. All the requisite steps were followed in the acquisition of the 36 Rafale jets. This includes preparation of Services Qualitative Requirements (SQR), Acceptance of Necessity by Defence Acquisition Council (DAC), Technical Evaluation and Acceptance of the technically qualified platform, commercial negotiations by Contract Negotiation Committee, and approval of Competent Financial Authority as per requirement of Defence Procurement Procedure 2013. The acquisition process for MMRCA had reached commercial evaluation stage after the completion of all standard processes as per the DPP. Approval of the DAC for procurement of aircraft from French government through an Inter-governmental Agreement was taken on May 13, 2015. An Indian Negotiating Team was constituted to negotiate the terms for the procurement of the aircraft. The INT was headed by the Deputy Chief of Air Staff of IAF. The negotiations lasted from May 2015 to April 2016. A total of 74 meetings including 48 internal meetings of the INT and 26 external INT meetings with the French side were held. Aspects pertaining to the responsibilities and obligations of the French government, pricing, delivery schedule, maintenance terms, offsets etc were discussed and negotiated during the meetings. Chairman of INT submitted the report on August 4, 2016, recommending approval and signing of IGA. After Inter-Ministerial consultations, the proposal was placed before the Cabinet Committee on Security (CCS) on August 24, 2016. It was approved by the CCS on the same day. Subsequently, the IGA was signed by the Indian Defence Minister and French Defence Minister on September 23, 2016. The document states that to promote indigenisation, a robust offset clause has been included in the DPP since 2005. The aim is to leverage our capital acquisitions to develop the Indian Defence Industry, improve defence research and encourage the development of synergistic sectors such as internal security and civil aerospace. The offsets are to ensure that for every dollar that went to a foreign arms supplier, 30 to 40 per cent get back into India for an investment or procurement. The offset discharge is to be undertaken through various offset avenues like direct purchase of eligible products/ services, FDI in JV, transfer of technology/ provision of equipment. As per the Defence Offset Guidelines, the OEM/ vendor is free to select its Indian Offset Partners (IOP), the Centre has stated. In the instant case, there is no mention of any private Indian Business House in IGA or Offset Contract. There are two offsets contracts in this case – one with Dassault Aviation and the other with M/s MBDA who are the French Industrial Suppliers of Aircraft Package and Weapon Package respectively. The Offset Contract does not envisage manufacture of 36 Rafale Aircraft in India by any public or private sector firm. As per the Offset Contract, the Vendor/ OEM is required to confirm the details of IOPs/ products either at the time of seeking offset credits or one year prior to the discharge of offset obligation. The annual offset implementation schedule as per the offset contract will commence from October 2019. The vendor/ OEM is yet to submit a formal proposal in the prescribed manner indicating details of IOPs and products for Offset Discharge. Interestingly, the Centre has also annexed a press release of September 22. As per the same, the Government has no role in the selection of Indian Offset Partner and the same is a decision of the OEM which is Dassault Aviation in this case. As per the guidelines, the vendor is required to provide the details of Offset Partners either at the time of seeking offset credits or one year prior to the discharge of offset obligation which in this case will be due from 2020. Read the Document submitted by Centre below.